Create great black and white photography. Is there a better alternative to Monochromist? 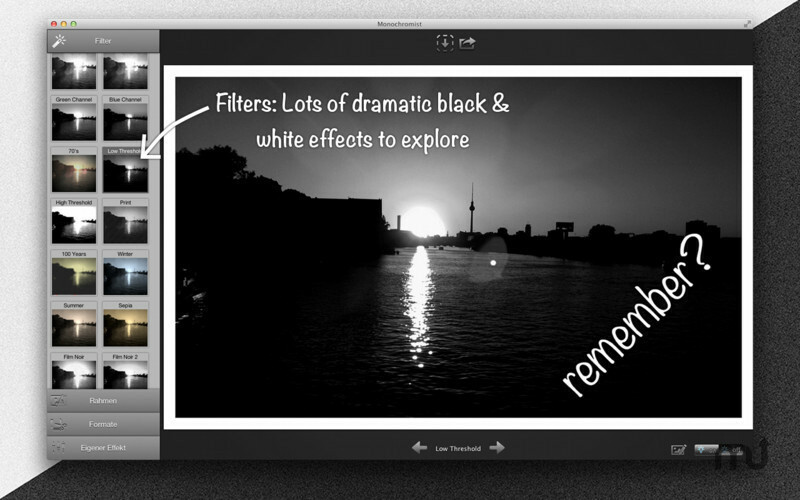 Is Monochromist really the best app in Image Editing category? Will Monochromist work good on macOS 10.13.4? Monochromist makes it very easy (and quite fun!) to create, edit and share your pictures in black & white. By removing colors you can enhance a photo, bring its subject to life and give it a whole new artistic quality. Create, share and enjoy the dramatic effect that monochromatic images have. Become a Monochromist today! Choosing a filter, format and frame is super easy and figuring out all the possible combinations is great fun. Monochromist needs a review. Be the first to review this app and get the discussion started! Monochromist needs a rating. Be the first to rate this app and get the discussion started!